The Manitoba Rh Clinical Program is based out of the Health Sciences Centre in Winnipeg. Two Manitobans physicians, Dr. Bruce Chown and Dr. Jack Bowman, are world recognized leaders in medical research. Dr. Chown is recognized for his work on Rh disease and a condition called Hemolytic Disease of the Newborn. People are born with blood that is either Rh positive or negative. 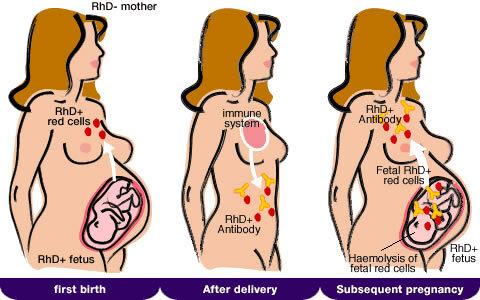 When a mother and her unborn child have different Rh factors, her immune system might attack her baby. Potentially, this could lead to all sorts of complications in the development of the heart, lungs and brain. In some cases, it would lead to death in utero or life-threatening complications after birth. Dr. Chown identified that the mother’s immune system was sensitized by the interaction of fetus blood with the mothers. The Chown/Bowman Team developed and tested a serum called Rh Immune globulin, which was licensed in Canada in 1968 and used to prevent Rh disease. This immunoglobulin or vaccine is now marketed as WinRho SDF (The “Win” stands for Winnipeg). The drug is now sold in 35 countries by the Manitoba-based research firm Cangene. Canadian Blood Services provides screening of pregnant women for blood type and red cell antibodies. This testing assists health care providers to ensure appropriate management of the pregnancy for both the mother and baby in order to prevent Hemolytic Disease of the Fetus and Newborn. In addition, the Laboratory also provides serological investigation reference services to facilities that perform post natal testing. Further information related to screening can be found by clicking here to be re-directed to the Canadian Blood Services Website.